For some reason on Christmas day we started talking about ice cream, and I asked my 3-year-old niece what her favorite flavor of ice cream was. Of course, ice cream is always a welcome topic, so I guess I don’t really need to wonder why we were discussing ice cream! It turns out her favorite flavor of ice ream is blue. Yep, blue ice cream. So, as the cook in the family, I decided that we needed to make her some blue ice cream. And, as she’s 3 years old, I didn’t want to recipe to be very complicated. I wanted a no cook, not too fussy, and tasty vanilla ice cream. So, I set about looking on Pinterest, and to my delight, I found the perfect recipe by Sumptuous Spoonfuls. I’ve known Ann at Sumptuous Spoonfuls for many years now, and all of her recipes rock! Tasty recipes! Easy recipes! Great photography! Please do go give her a visit. You’ll be happy you did! My niece and I made the ice cream batch that you see in the pictures. She did most of the work for it. I had measured out all the appropriate amounts. She poured them all together. She stirred it all together (and I checked, it wasn’t quite all stirred, but that’s ok, the recipe is so good that the ice cream rocked anyway!). She poured the mixture into the ice cream maker! So, this is a GREAT recipe to make with your little kiddos. Now, I know, food coloring should be avoided. I know. I know. Please don’t leave me mean comments. Sometimes it’s fine to do little treats. They’ll be fine. It is, after all, a sometimes treat. We had an ice cream bar for toppings to go with our blue ice cream. We had M&Ms (plain and peanut), Mini York Peppermint patties (which were amazing in this), rainbow sprinkles, and pink sugar sprinkles. It was tons of fun playing with and eating blue ice cream. And, we all ended up with blue tongues to prove we had eaten it! This Blue Ice Cream is a nice vanilla flavor that’s sure to please everyone. And, the ease of not having to cook it is simply awesome! Stir all ingredients except the blue food coloring together in a medium bowl. Stir in the blue food coloring until the desired blue color is reached. Pour the mixture into the bowl of your ice cream machine, and process according to the manufacturer's directions. The ice cream will be soft like soft serve when it comes out of the machine. Or, you can freeze it to make it more solid. Serve with the toppings of your choice, like rainbow sprinkles or M&Ms. This is such a fun idea for parties! I bet my nephews would LOVE blue ice cream! I need to make this with my boys!! They are going to love it! Always play to your audience, no matter the age. You did just that. No need to tell anyone that you probably enjoyed it just as much! Perfect for kids!! Love the bright color. This ice cream is so fun and I love how easy it is! I can certainly see why “blue” is her favorite flavor! Well done! How fun! This would totally be the Cookie Monster’s top choice for ice cream. nice little twist to regular vanilla ice-cream.. loved the colour!!! Im loving this blue color!! YUM!!! How utterly adorable is this!? Why do I feel like it would be bubblegum flavoured though. I seem to remember having a blue bubblegum ice cream when I was a child. 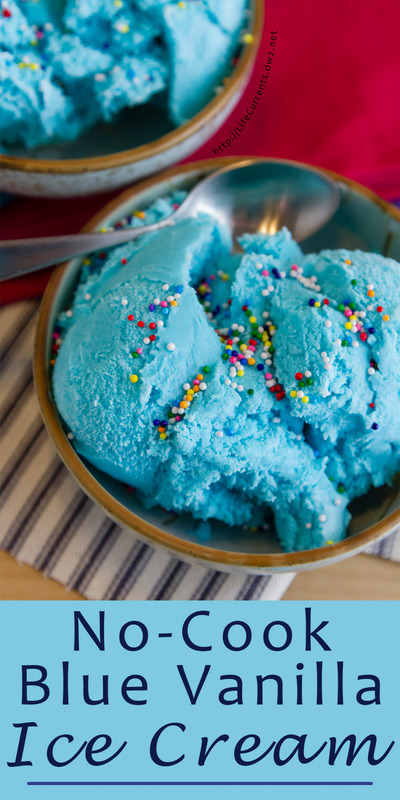 My kiddos would LOVE making this blue ice cream!!! I always have food coloring laying around and I never know what to do with it – great idea!! Super fun idea!! My kids would love it! I love no cook ice creams and this one is so darn pretty! I love when kids say cute things. I really wish that I had written down everything my kids said when they were little. Blue as a flavor seems totally legit! A no cook ice cream is even better! The color will have the kids running to get it. It’s so different and really cool!